Following the 1997 launch of Skawennati’s (Mohawk) CyberPowWow, digital space has become a vital new territory for the resurgence of Indigenous storytelling and cultural practice: “We have signed a new treaty,” Cree artist Archer Pechawis wrote of this period, “and it is good. We have the right to hunt, fish, dance and make art at http://www.CyberPowWow.net, .org and .com for as long as the grass grows and the rivers flow.” This course will critically explore the theoretical, cultural, political-economic, and gendered dynamics underwriting the histories and futures of Indigenous new media. Particular attention will be given in examining the ways in which new media and digital storytelling connect to and support key issues in the field of Indigenous studies, such as sovereignty, self-determination, decolonization, and land rights. In terms of structure, each meeting in this course will be oriented around selected themes in Indigenous new media, including digital works, and critical readings. The course will be comprised of a combination of lectures, guest speakers, in-class demonstrations and workshops, and group discussions. Each meeting will integrate seminar lectures with close readings provided by students and workshop activities. Such activities will include, audio production and editing, HTML coding, CSS, blogging, and podcasting. Successful completion of this course will provide students with the skills and confidence to understand and critically analyze the cultural, social, political, aesthetic, and economic dynamics in Indigenous media. The theoretical concepts presented will be applied to reframing colonial representations of Indigenous peoples away from the “dead or dying Indian” towards vital, living cultures that promote decolonization and empowerment. The practical skills developed will allow students to produce their own content and actively participate in these processes. Dr. David Gaertner will be your instructor for this course. David is a settler scholar of German descent and an Assistant Professor in the First Nations and Indigenous Studies Program at the University of British Columbia. He has published several articles on Indigenous New Media and has worked closely with new media artists such as Skawennati, Kevin Lee Burton, and Quelemia Sparrow. David will be responsible for evaluating student performance and leading focused lectures, workshops, and discussions on the course themes and assigned materials. • Introduce students to the history and development of Indigenous New Media. media across a variety of platforms. blogging, basic website design, podcasting, radio, and film fundamentals. • Improve presentations skills and ability to engage audiences. Course Grading Scale: A-range = exceptional insight into the issues or problem at hand, very careful planning and analysis demonstrated, exceptionally detailed investigation of materials, research area, and methods demonstrated. B-range = significant insight, clear presentation and analysis of materials, detailed investigation of materials demonstrated. C-range = coherent argument, basic level of analysis apparent, basic knowledge of materials demonstrated. D-range = no clear analysis developed, minimal knowledge of materials demonstrated, factual inaccuracies. F-range = basic knowledge of materials not adequately demonstrated. Attendance and Participation (10%). Participation will be assessed based on the quality of your active engagement in the class, large and small-group discussions, in-class workshops, Twitter contributions, and your dedication to the course’s ethos of respectful engagement. Students uncomfortable with public participation can arrange for alternative participation opportunities, such as office hour meetings, response writings, etc. Excessive absences, tardiness, disruptions, and other disrespectful behaviour will seriously impact your participation grade. Bring your laptops to class. We will be using them. Sharing and disseminating: In addition to each of your own entries, you must also comment on one of your classmate’s posts (100 words minimum) for each of the four assignments. Please email me both a link to your post and the post you commented on before class on each assigned date. Oral presentations are delivered by students at the beginning of class as a means to initiate conversation on that day’s content. They are organized as panels. As presenters, select one of the pieces we are studying during a particular week and offer a careful, analytic interpretation of it drawing on class readings, lectures and discussions. Your analysis should provide analyses of both the medium and the message of the piece and make use of concise examples. The purpose of the assignment is to develop close reading skills in the context of new media and to initiate conversation in class based on student ideas and insights. Presentations will be graded for clarity, originality, oral delivery and effectiveness in generating discussion. You must email me your notes at least 12 hours before class. The presentation signup sheet will be circulated in class September 12 & 19. You must present on the content assigned for that day. Your presentation should be between 10-15 minutes and should include a question for discussion. Creative use of technology is encouraged but not required. In the summer of 2016 UBC broke ground on the Indian Residential School Dialogue and History Centre (IRSDHC). One of the major challenges for the Centre is disseminating residential schools data to a variety of audiences in informative and engaging ways. For this assignment students will work in groups of 3 or 4 to conceptualize a media strategy for the IRSDHC. What kind of technology would you use to communicate residential school history? Would your data be interactive or stagnant? Why? Linc Kesler, the director of the UBC First Nations House of Learning, will be visiting class on October 17 to discuss the Centre and outline the design challenge. Presentations will be made the following week in class. Your pitch should be well considered, engaging, and informative. Be creative and show your knowledge of digital media. You do not need to include data from residential schools or the TRC (if you require content it can be from an alternative source, such as Indigenous Foundations), but you must be able to speak to the ways in which your platform specifically engages with residential schools in a way that respects their seriousness and encourages audiences to learn and reflect. Making your own digital stories is key to learning how they function and the impacts they can have on audiences and storytellers. Working in groups of 3 or 4, produce a short digital story that engages Indigenous issues. Content does not have to be original: you may chose to remediate or adapt an existing story, poem, or piece of digital media. Just remember to credit your sources. Stories should be critically driven but also engaging and creative. Groups should be formed by week 3. Projects will be quite unique, and required elements will vary; they will, therefore, be developed in close consultation with the instructor who will discuss project specific requirements. This final group digital project can take four different forms. ● An original web-based story: Make an original web-based digital story, drawing inspiration from the literature, issues, and formats we are studying in this class. ● A web-based digital edition or adaptation: Make a web-based digital edition or adaptation of a piece of literature, film, or digital storytelling produced by an Indigenous author/artist. ● An audio podcast: Make an audio podcast about one of the stories we have read, or one of the themes we have discussed in this course. ● A digital video: Make a short digital video that tells a story about one of the works we have read, or one of the themes we have discussed in this course. The final group project must be submitted 12 hours before the last day of class, where it will be screened for your instructor and your classmates. Evaluation will be based on the quality of the ideas and critical content, creative engagement with the material and digital methods, rigour and carefulness of the work, ability to collaborate effectively with the group, and ability to communicate effectively. Treatments: Groups must also complete and turn in a story treatment (due November 14). Treatments should indicate the choice of platform, a rough idea of content, and a brief paragraph theorizing how the former and the latter intercede. This is a rough outline of what we expect to accomplish in Indigenous new media. It is subject to change depending upon availability of materials and guest speakers. Review syllabus and course expectations, signup for oral presentations. Students will be introduced to media studies and the distinctions between form and content. We will engage with one of the most prominent thinkers in media studies (McLuhan) and explore Indigenous critiques of his theories (Loft). Students will also be introduced to new media analysis and have the opportunity to practice deploying close reading techniques on selected pieces. In our second class we will engage with Indigenous media studies as it applies directly to cyberspace and digital media. 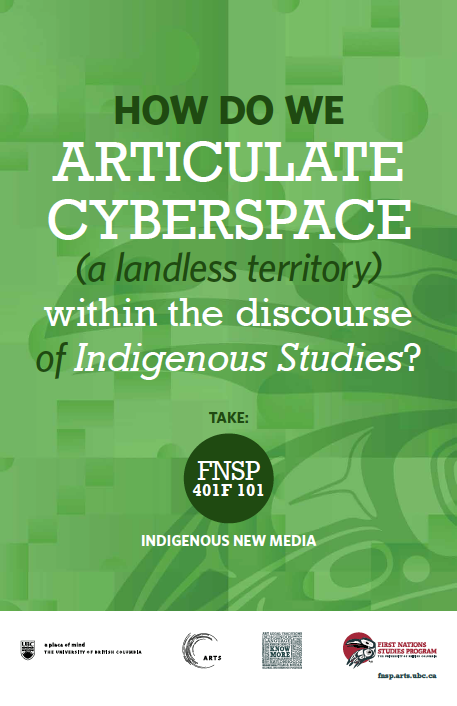 Students will be given a history of Indigenous cyberspace as it develops out of the late 1990s. Students will also have the opportunity to engage with a rare copy of Skawennati’s CyberPowWow, the first online, interactive Indigenous art gallery. In this class students will also be introduced to the gendered implications of cyberspace and the contributions of Indigenous women to this space. Reading: Loretta Todd, “Aboriginal Narratives in Cyberspace.” Coursepack. Students will be introduced to the notion of “screen sovereignty.” Using Burton’s work as an example, we will discuss the ways in which sovereignty and self-determination apply (and don’t apply) in digital spaces. In the final portion of class we will discuss trials and tribulations students may have encountered with the first blog post. Reading: Kristen Dowell. “Vancouver’s Aboriginal Media World.” Coursepack. Linc Kesler will be visiting class to speak about the Indian Residential School Dialogue and History Centre. In the second half of class students will work on their own design pitches for the IRSDHC. Reading: Angela Haas: “Wampum as Hypertext: An American Intellectual Tradition of Multimedia Theory and Practice.” Coursepack. Students will present their media pitches for the IRSDHC. Reading: Christian Sandvig, “Connection at Ewiiaapaayp Mountain: Indigenous Internet Infrastructure.” Coursepack. Students will be introduced to the concept “Indigenous Futurism.” We will consider the concepts applications in relation to the fields of new media and Indigenous studies, focusing on the potential of futurism and science fiction to decolonize. Reading: Jason Lewis and Skawennati Tricia Fragnito, “Aboriginal Territories in Cyberspace.” Coursepack. In this class students will be introduced to basic web languages, including HTML and CSS. We will be looking at the code behind some popular websites and I will introduce a few digital storytelling platforms that you may use for your digital story assignment. In this class we will be considering the “oral tradition” and its application in new media forms. Students will engage with the notion of “land as pedagogy” and apply it to Quelmia Sparrow’s podplay “Ashes on the Water.” This class will take place on site. Please meet at Main & Powell at 11am. Grunt Gallery staff member Tarah Hogue Students will lead in a workshop/discussion on ekphrasis, the description of a work of art produced as a rhetorical practice. We will also study a Vancouver specific piece from Cheryl L’Hirondelle and discuss how she reimagines the Vancouver landscape. Reading: Jolene Rickard, “First Nation Territory in Cyberspace Declared: No Treaties Needed.” Coursepack. Student digital story screenings and potluck.